© North Coast Journal | Miles Eggleston Little River Preferred Trail Extension. Photo by Grant Scott-Goforth Cyclists and pedestrians currently have to travel along U.S. Highway 101 about a mile and half between the Crannell Road and Westhaven South exits. A one-mile extension of the Hammond Trail's north end took a key step forward recently, but a lack of funding and debate about who would maintain the new trail is holding up the process. The "Little River Trail," which would extend Hammond Trail from its current terminus at Clam Beach County Park across Little River to the south end of Trindad's Scenic Drive, has been in planning stages since the late 1980s. The project advanced with completion of a trail feasibility study last year and the April purchase of a 14-acre Green Diamond Resource Company parcel by the nonprofit Trinidad Coastal Land Trust. 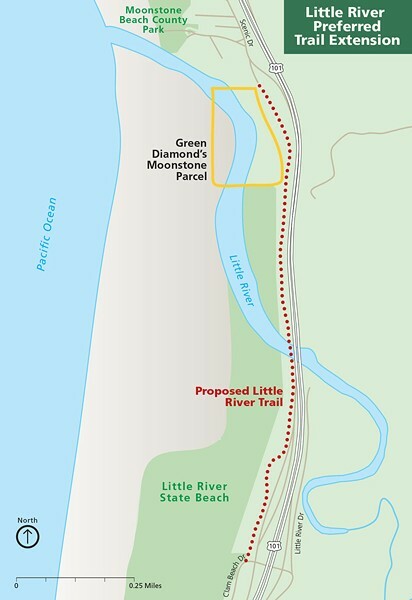 The parcel, which lies just south of Moonstone Beach and to the west of U.S. Highway 101, had been the only privately held parcel in the planned trail's corridor and allows coastal and Little River estuary access. A $90,000 federal and state grant enabled the purchase. A state-funded feasibility study prepared by the Redwood Community Action Agency (RCAA) proposes that the extension's northern half mile would run in the Caltrans right-of-way parallel to Highway 101 from the southern end of Scenic Drive to the Little River Bridge. 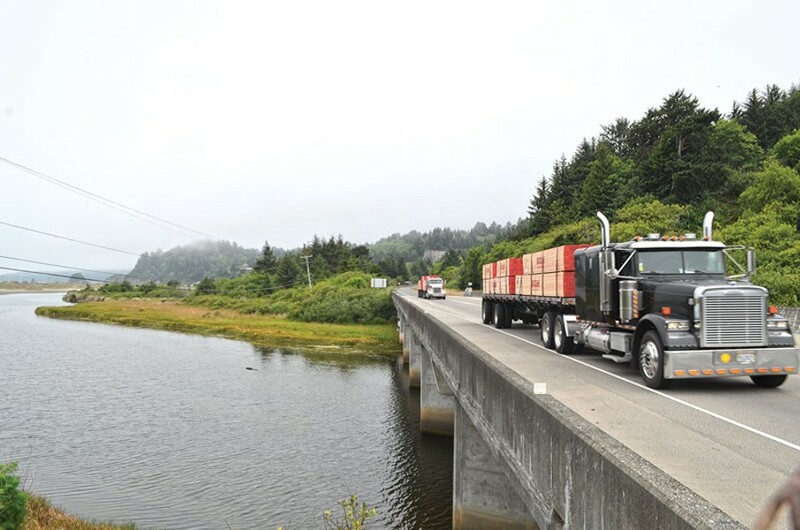 Widening the Highway 101 bridge would allow for placement of a 374-foot-long, 10-foot-wide barrier-separated trail lane. The proposed southern alignment would run from the river crossing to the Crannell Road area of Clam Beach County Park. This stretch would also run within Caltrans' right-of-way except for a brief diversion into Little River State Park to avoid a dune hollow. The proposal also includes a trail loop that would separate equestrians and hikers from bicyclists and a spur providing coastal and estuary access. It will not be cheap. The bridge crossing alone is estimated to cost $2.5 million and the trail extension's total cost could reach $4.5 million. And finding an agency willing to take responsibility for the trail's operation and maintenance, a step that has to be taken before funding is secured, is proving to be a challenge. Sungnome Madrone, a main participant in the development of the Hammond Trail and one of the consultants who worked on the feasibility study, said Caltrans would be the appropriate trail operator. The trail development process can get rolling "as soon as Caltrans comes to grips with the fact that they are responsible for taking on maintenance of the Little River Trail," he said. Madrone said Caltrans is the logical choice since most of the trail will run through its right-of-way and the project would address the "unmitigated impacts" the agency's Highway 101 and Little River Bridge construction have had on non-motorized transportation. "How we would make it happen is through public pressure," Madrone continued. But Caltrans is only agreeing to maintain the trail's bridge crossing. When asked about the likelihood of the agency taking on overall maintenance, Caltrans Region One Public Information Officer Myles Cochrane said, "That's not going to happen." He added that "maintenance would be up to the county and that's traditionally how it happens." The county's Department of Public Works contributes to maintenance of the Hammond Trail but its commitments to the McKay Community Forest and the Arcata-Eureka and Annie and Mary trail projects make taking on additional responsibilities improbable in the near-term. Don Allan, a Trinidad Coastal Land Trust board member and the senior project manager of RCAA's Natural Resources Division described the Little River Trail as a "great addition" to the Hammond Trail. He acknowledged that other trail projects, such as the Humboldt Bay Trail and the Annie and Mary Trail in Blue Lake, are considered as area priorities. "But one thing about the Little River Trail is that it does not have to contend with the [North Coast Railroad Authority] and that's why we're quietly telling people that the Little River Trail is ready to be built," he said. "We have no obstacles and all we need is public support and funding." Madrone estimated that once a maintenance agency is designated, it would take from five to seven years to build and open the trail. Funding for further design work, permitting and construction is another uncertainty. Sections of the Hammond Trail and Eureka's Hikshari Trail were funded by voter-approved bond propositions but that source is almost fully tapped. Federal Transportation Development Act funding is a potential source and already pays much of the bill for Hammond Trail upkeep. But according to the feasibility study, its trail-funding capacity may diminish as other transportation needs emerge. Another federal source, the Active Transportation Program, is administered by the state and the feasibility study identifies the support of the California Coastal Conservancy as an important element of gaining its funds. The conservancy is already invested in the project, as it provided 60 percent of the grant funding for the land trust purchase. Peter Jarausch, the conservancy's Little River Trail project manager, said his agency is "definitely interested in helping out," as the trail furthers the goal of completing the statewide California Coastal Trail. "But my impression is that there are other stretches of the California Coastal Trail that the county is prioritizing more," he added. Madrone said the purchase of the Moonstone Beach parcel was a promising development. "Thirty years ago, I promised myself I wouldn't retire until the Hammond Trail is built all the way to Trinidad and this is a significant step forward," he said. Daniel Mintz is a freelance journalist based in Eureka who has been reporting news in Humboldt County since 2001.